People who complain when it rains are not looking at the positive. People who complain when it rains are not looking at the positive – all that water helps barley and hops to grow! 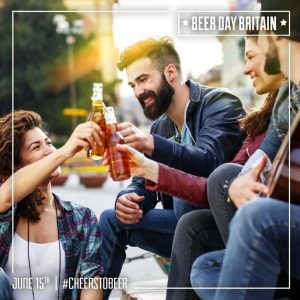 It also fills Britain’s reservoirs, streams and springs meaning that brewers have a ready source of the most fundamental ingredient in beer. Soft water low in mineral salts is ideal for Pilsner lagers – showcasing the sharp bitterness of hops and the sweet biscuit of the malts. (e.g Plzeň in the Czech Republic). Medium hard water high in calcium chloride is good for making sweeter beers such as Mild and Brown Ale (e.g. Britain’s West Midlands). Very hard water high in calcium bicarbonate is used to make Stout. Water that contains calcium bicarbonates is very good at extracting colour from malt. (e.g, London and Dublin). Some brewers have their own source of water, a well or spring but most brewers rely on the local mains water, known in brewing parlance as ‘town liquor’. Brewers can add or subtract salts to suit the beer they want to brew. Adding mineral salts to water to make beers such as Pale Ale and Bitter is a process called Burtonising or Burtonisation as the brewer aims to replicate the water found in the town of Burton-upon-Trent in the Midlands. Historically in areas where water was not safe to drink beer was a secure alternative. It was literally a life-saver. So next time you drink a glass of beer thank your ancestors for doing the same all those years ago and surviving to ensure that you would exist!